Last weekend on April 10th, I celebrated my 48th birthday. My brother-in-law and his family drove down from Georgia to visit us for the weekend. 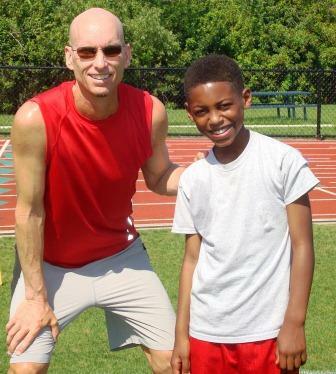 My nephew and young runner, Noah, visited our practice session. We had some Chinese Olympians working out at one corner of the Out-Of-Door Academy track and we were at the other. It was a fun morning filled with strength building exercises for runners. We began the warm-up with a 3 mile easy run, then did my mobility and bounding exercises. To commemorate the 10th – we did 10 x 1/4 miles with one and a half minute rest in between each 1/4 mile. Then we hit the hurdles, medicine balls, weighted vest push-ups, heavy band pulls, and 3D stretches. Please check out this short video on my 48th birthday workout and see how our training is progressing. The running portion of the strength workout is to perform 1/4 mile repeats at mile race pace (for me 1:08-1:13 per 1/4 mile). The repetition is key to connect the mind-body relationship. I can tell you “to the second” what time we were running each interval. My body gets used to the feel of the pace and my mind records it as well. We need to train the body and the mind with our interval workouts. There is no such thing as “muscle memory” as there is no memory in the muscle, but there is memory in the mind. The mind remembers these movement patterns. This is the same with the exercises to build overall body strength and specific strength for running. The mind remembers your movement patterns. So please exercise correctly to not only avoid injury and build strength, but also to train the mind on how a proper exercise is performed. Posted in - My Daily Journal 2011, Author - David O'Meara, Topic - Training.